The beginning of Johannes Võerahansu’s creative career was in the latter half of the 1930’s. 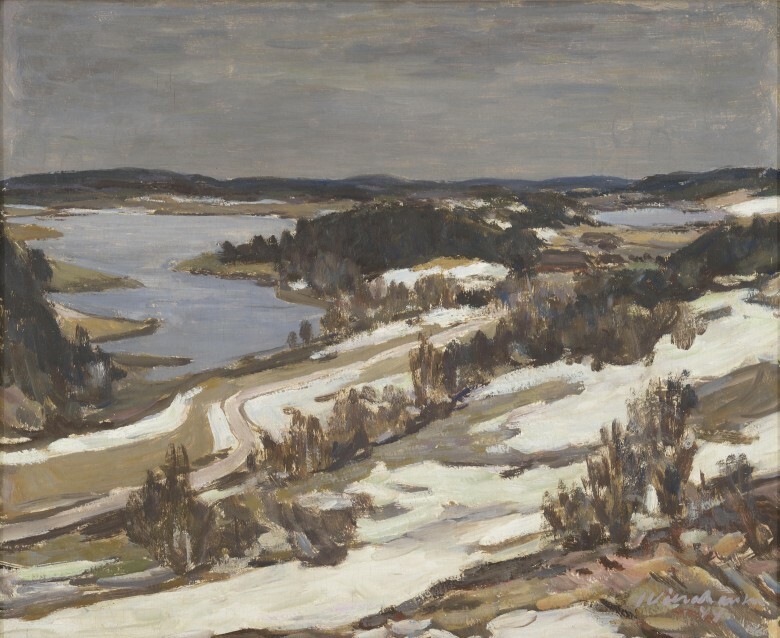 Even though he began his studies in art at Ants Laikmaa’s studio in 1919 already, he had to concentrate on other matters in the meantime for some ten years, for instance helping his father with the work at the mill. Finishing school was thus postponed until 1936, 17 years later! At the turn of the decade, Võerahansu lived in Tartu and actively participated in exhibitions. Regardless of his late start, there are numerous works completed in the early 1930’s in his artistic legacy. For this reason, he was an established artist by the beginning of the 1940’s. Võerahansu is known during that period first and foremost for his Saaremaa cycle, where he went among other things as a drawer as part of an Estonian National Museum expedition, yet where he also began painting. "Drought" is dated approximately in the 1940’s yet it is difficult to say more precisely when it was painted. This work was nevertheless probably completed after 1940 since several trends characteristic of this work took root during that period throughout Võerahansu’s work: his style became simpler, more connected to life, more straight-laced. 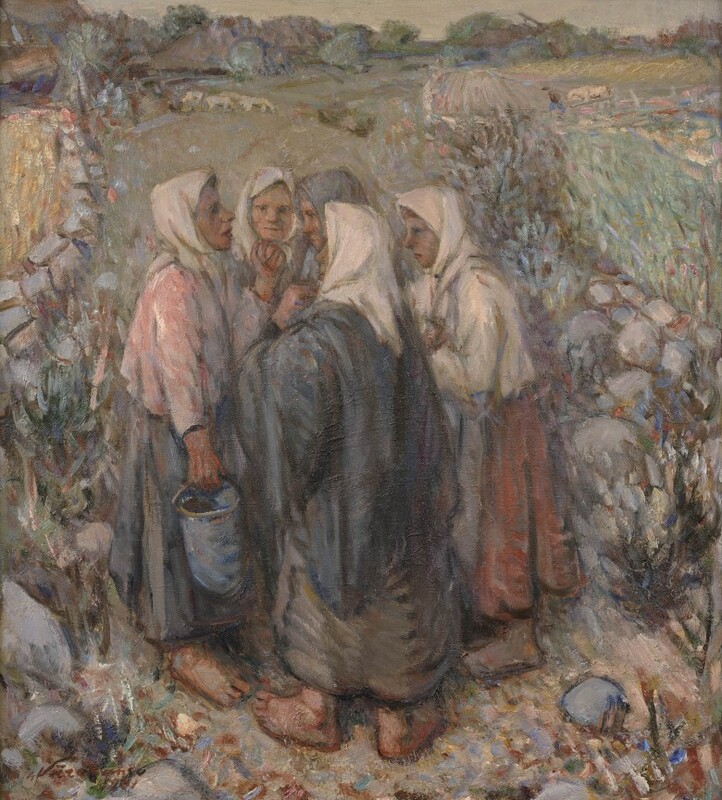 His paintings, however, are often based on some specific theme (for instance, peat cutting, blind people, the potato harvest, shepherds, and other such topics). 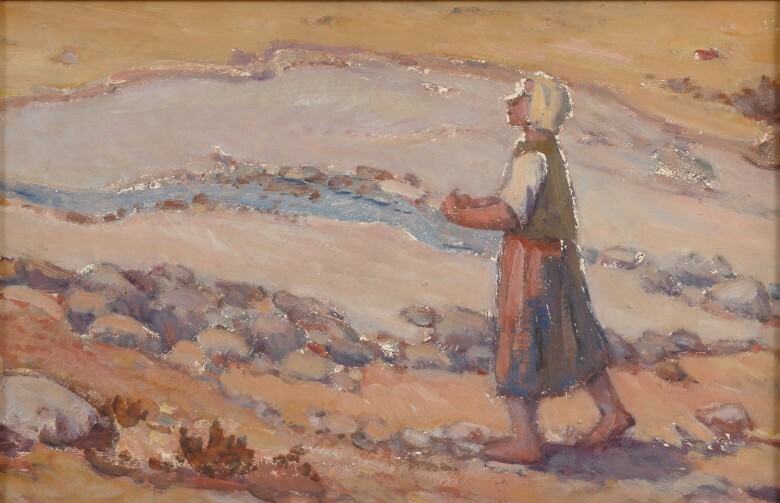 Incidentally, Võerahansu had created another preliminary work entitled "Drought" (oil/pasteboard) in 1947 with exactly the same dimensions as this work. This is no wonder since “drought” is a theme that is repeatedly found in Võerahansu’s work and he reportedly even planned to create a triptych of the same name, apparently to refer to the dramatic and even tragic struggle of islanders against scanty natural conditions. The tradition of depicting Saaremaa, Estonia’s largest island, is lengthy and associated among other things with romantic nationalist ideals. Eugen Gustav Dücker was one of the first to depict Saaremaa and Konrad Mägi, Nikolai Triik, Eerik Haamer, Johannes Võerahansu, Elmar Kits, Evald Okas, Peeter Mudist and many others continued working on Saaremaa in the 20th century. It can be said that Saaremaa is the most frequently painted place in Estonia. In addition to romantic and picturesque views (the particular diffraction of light on algae in areas near the shore, for instance, is also mentioned), the reason for this can also be considered to be nationalist moods: the Estonian mentality was created and embedded through the depiction of the landscapes of Saaremaa, tying that mentality to the harsh yet sturdy natural setting in the difficult conditions of Saaremaa. The most striking part of Johannes Võerahansu’s creative work is no doubt his works with Saaremaa themes, which he created throughout his work. As one of Ants Laikmaa’s students, he went to Saaremaa as a youth already on a trip to collect old objects of folk handicrafts and started depicting the island more intensively in his paintings in the 1930’s. The traditional lifestyle of the island and its idyllic depiction were also important for him. This work was completed in 1941, for which reason it could be compared to Richard Uutmaa’s "Fishing Net Menders". A certain political message can also be seen in the depiction of a landscape and lifestyle associated with Estonian identity in the context of the time when it was painted. Johannes Võerahansu had no personal ties with Southern Estonia – unlike Konrad Mägi, for instance, who was from that part of the country. Võerahansu was born and raised in the flat country of Raplamaa and thus his view of Southern Estonia was also not as personal and intimate as it was for some other artists. It was more panoramic instead. Võerahansu surveys Southern Estonia’s picturesque landscape with the eyes of a curious onlooker. The season should be noted separately. Even though four seasons are characteristic of this area’s climatic zone, artists have always preferred spring or summer in depicting landscapes. Snow (Võerahansu has separately stressed the relative importance of “snow” in the title) covers up many nuances of colour while generalising and equalising everything. For Võerahansu, who did not even want to delve into details, snow was in harmony with his overall aspirations.